Columbus pellet hops.10-16% AA. Pungent floral aroma with some citrus flavors and clean bittering. 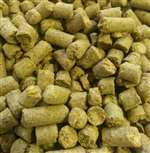 Used in a variety of beer styles like American pale ales, IPAs, stouts and even lagers. Use Centennial, Chinook or Nugget as possible substitutions.